A trip to Texas would not be complete without eating some BBQ. Being from North Carolina, I am very particular about my BBQ. To me BBQ is pulled pork. I am not as particular to whether it is the tomato based western style sauce or the eastern style vinegar based sauce. The key ingredient is it is slow cooked pulled pork. I have brought you posts from two of my favorite BBQ places in NC, Lexington BBQ and Bridges BBQ. If you have never been to NC then you can look at those to understand where I am coming from. 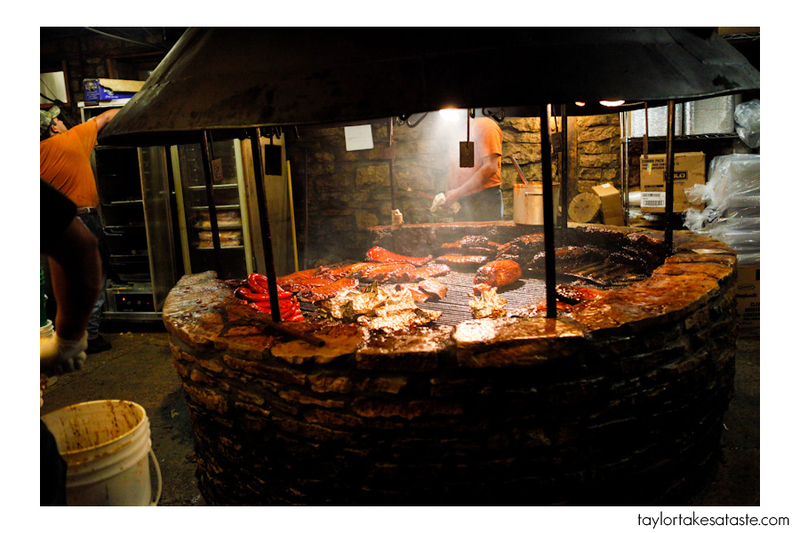 For my Texas BBQ experience, I went to Salt Lick and Black’s. 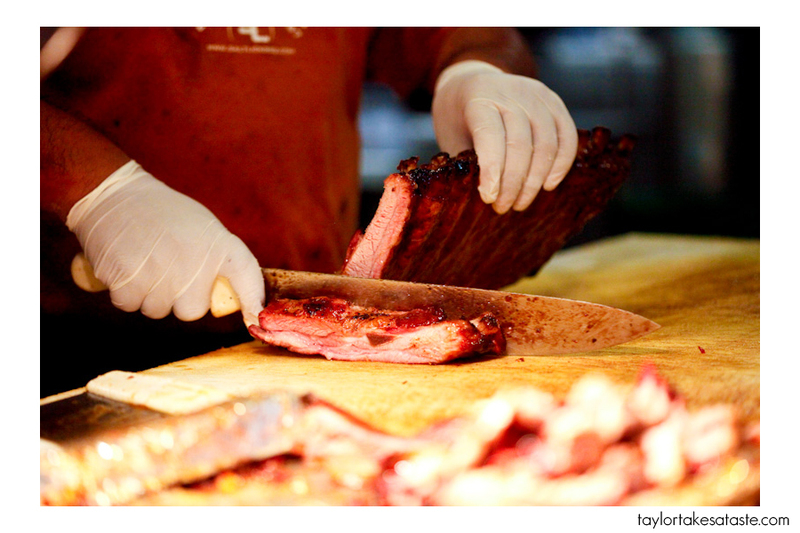 Today I am going to share with you my experience at Salt Lick. When talking to my friends who live in Austin they said Salt Lick is a must to check out. It is a about a 25 minute drive outside of Austin, but it is worth the drive. When seeing this sign, I knew I was at some place special. It is one thing for a restaurant to serve great food, but it is another to combine that with a cool atmosphere. Yes I know cool might not be a weak descriptive adjetive, but take a look at the surroundings. Doesn’t that look like a lot of fun? Not convinced? I forgot to mention that is is also BYOB. 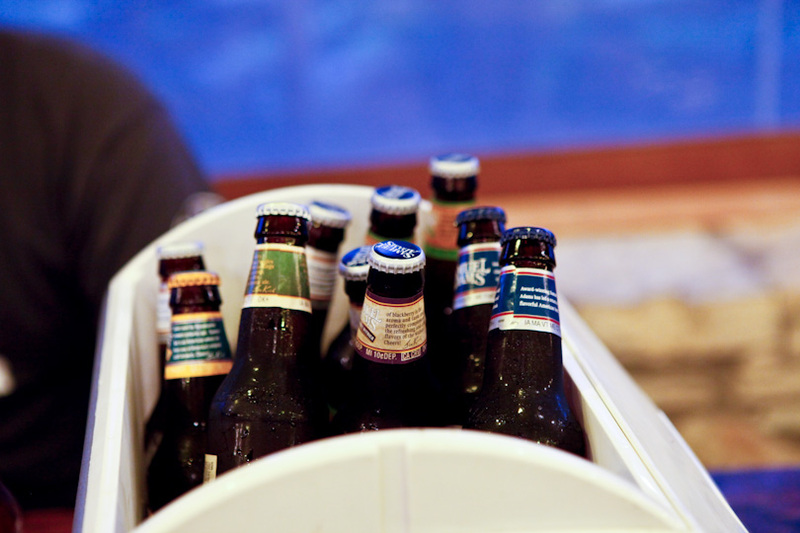 So you can bring one beer or..
Beer by the cooler! I am already loving this place and I have not even tried the food yet. The most important part. The food. As you can see in the first picture I got a large plate full of a wide variety of meats. My plate came with the sausage, brisket and pork rib. This was accompanied by cole slaw, this potato salad/mash (amazing had a vinegary mustard type taste that I had never experienced before) and baked beans.You can order by the plate or get specific cuts of meat. There is also the family style option. With this option you get unlimited plates of meat and sides with it. If you are really hungry then this is a good way to go. The meat is served with their house made BBQ sauce. I am not exactly sure what the combination of ingredients and spices are in this sauce, but it was unique. The closest I can describe it to is a sweet/spicy/vinegar/mustard combination. To truly understand you will have to try it for your self. You might wonder how all this meat is cooked? Well it is made on an enormous open pit that sits inside the restaurant. The smell is intoxicating. Be prepared for a food coma after you are done eating. Especially if you go the family style route. Mmm look at those ribs. Has my opinion of BBQ changed? Would I be shunned in returning to NC and acknowledge that Brisket is the real BBQ? 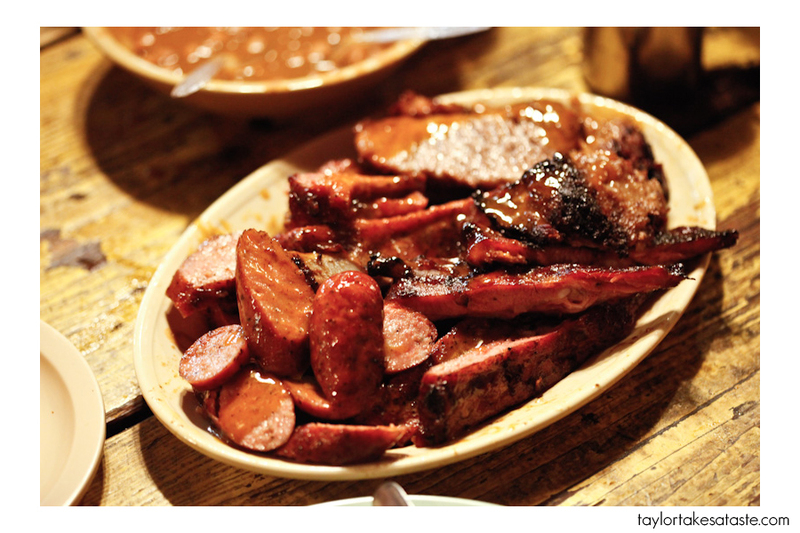 Have you been to Salt lick? What is your opinion on BBQ? we wanted to go there during our last trip to Austin, but had a gift certificate for Ironworks. next time we’ll certainly try it b/c how can you NOT love barbecued meat? i’d rank pork, brisket, sausage, ribs, but my boyfriend would agree with your ranking. My husband and I were just in Austin last weekend visiting my brother and sister-in-law, and we made it a point to make the trip out to Salt Lick. 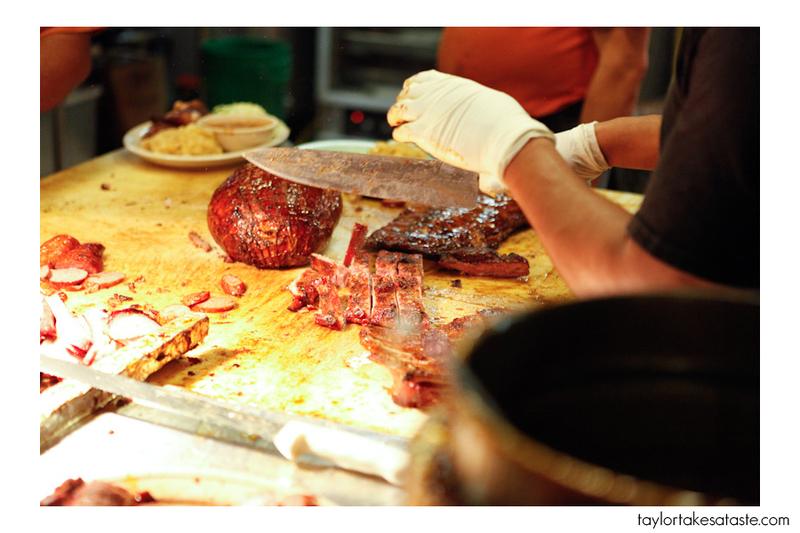 I’m not typically a huge BBQ fan, but my gosh… the meal we enjoyed there was outstanding! My favorite meat was the sausage – so juicy yet crispy on the outside. My mouth is watering just reminiscing about it. 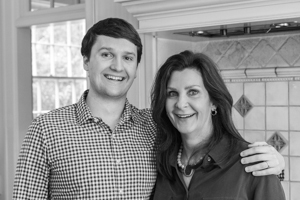 Your photos are beautiful – great recap of a delicious meal experience! Taylor– That place looks incredible. I can’t wait to go when were in Austin. I’m with you, smoked pork is still king. LOVE Saltlick! I would have to say though, that being a native Texan, I would go with briskit, ribs and then the sausage. You are right though, there is no comparison of Texas briskit to North Carolina pulled pork. My boyfriend has family in North Carolina so I have tried both, and honestly, NC BBQ is just too vinegary! My family LOVES the Salt Lick!! 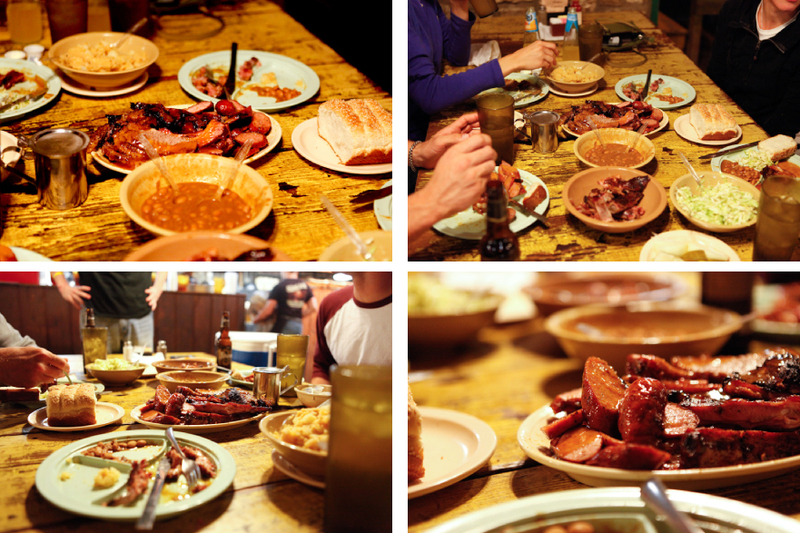 We sometimes make special trips to Austin from NC just to eat at the Salt Lick. Awesome pictures. 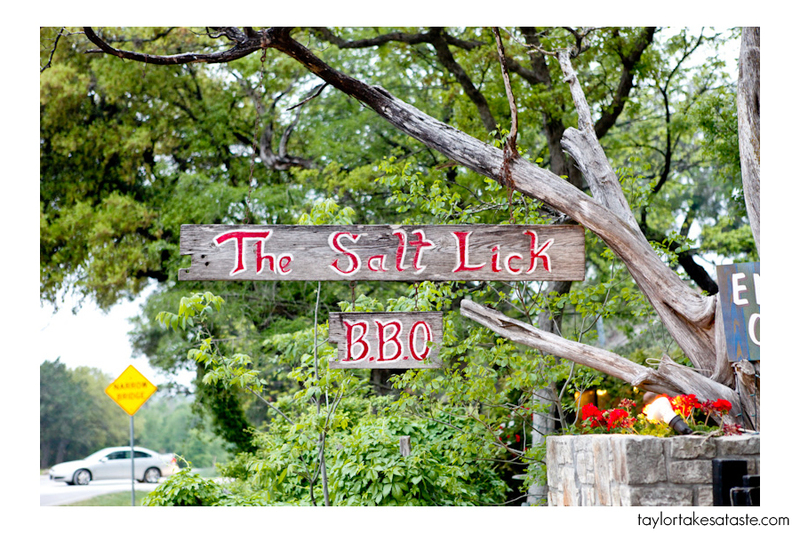 I have been to Salt Lick, and I didn’t like it at all. I don’t know why my opinion differs from most people who go here, I found the BBQ just not outstanding at all. My ex-husband felt the same way, and we are from two different states (I’m was born and raised in Texas and Oklahoma; he was born in a rural area of North California but knows his BBQ). 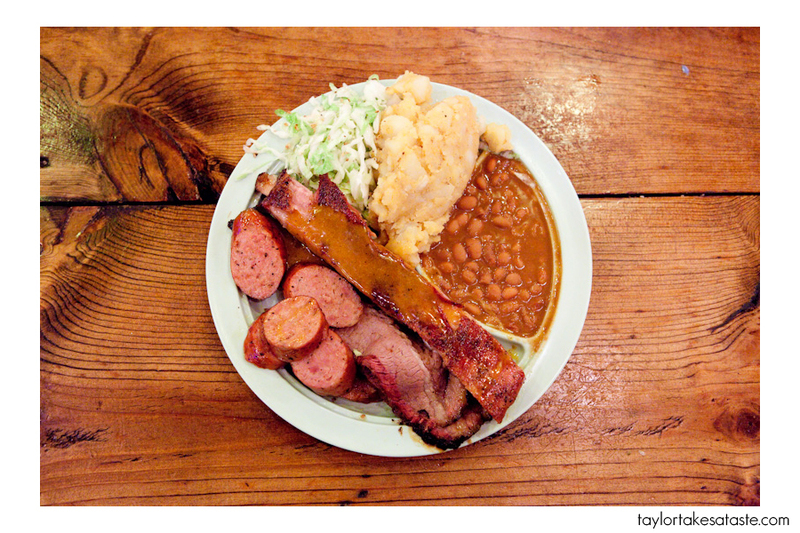 I remember my first (and last visit) to Salt Lick. I ordered the variety platter like you so that we could find out what our favorite dish was. Everything, including the sides, was terrible. We left the restaurant shocked and disappointed. I still do not understand why so many like this place. Conversely, after my first (of many) trips to Rudy’s BBQ, we fell in love instantly. My ex-husband would eat there almost daily at the beginning. He still mentions that out of all things in Austin, Rudy’s is what he misses the most (yes, most likely over me hahaha). 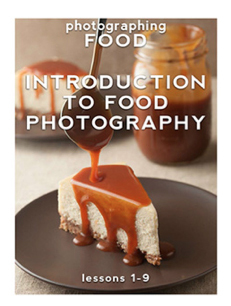 Nevertheless, your photos make the meat look good. 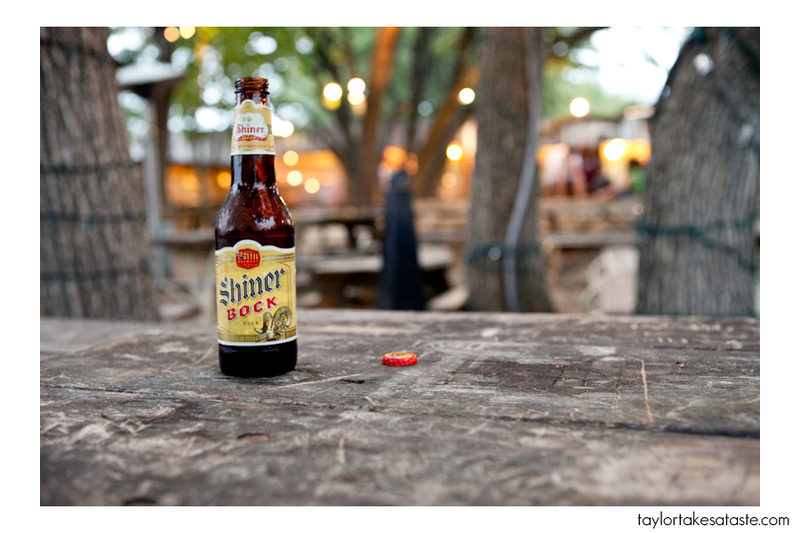 I don’t think I’ll ever give Salt Lick a second try, though, especially with Rudy’s around. After thinking about it a bit, I think the presence or absence of alcohol is the primary factor behind liking this place. My ex-husband and I don’t drink alcohol, so that may be why we didn’t like this place. Maybe the beer in everyone’s system causes them to like food that would normally be below standard in an otherwise sober state. I have heard of people being like that with pizza sold near bars. LOL! Just a theory. I am in total agreement with Memoria – we went to the Salt Lick a couple weeks ago and came away completely disappointed and disgusted. We found the food completely bland and lacking any taste whatsoever. Plus we were given more sides than we got meat. When we got the final bill, we felt like we had just been robbed!! In my honest opinion, this place is just overpriced & overhyped. I’m just sorry you never tried Rudy’s BBQ. Such a fun experience there and they are always glad to see their customers. We were not treated this way at the Salt Lick. Oh….. And the kicker??? We all got sick that day after eating at the Salt Lick and had to skip dinner. Boooooooooo.